The third annual Hudson Library & Historical Society's Ohio Author Day & Book Fair will feature over 40 authors on Saturday, April 20, 2013 from 1-4 PM. Several of the authors have had their books reviewed in the New York Times and other national publications. One has been offered a movie deal and another is a James Beard Award Winner: Best Baking and Dessert Book of 2011. Come meet these fascinating authors and illustrators, buy their books, get some autographs. The Learned Owl Book Shop will be on hand selling many titles of these Ohio authors. The morning of April 20 starts with a panel discussion for writers from 10 AM to 11:30 AM. "Where Fiction Comes From" will be moderated by Pauline Chen, author of The Red Chamber, a reimagining of the epic Chinese classic love triangle, "Dream of The Red Chamber." Panelists will include Josh Rolnick, writer of Pulp and Paper and winner of the 2011 John Simmons Short Fiction Award; Jean Considine, screenwriter for Doc and Emmy award winner; Varley O'Connor, author of The Master's Muse; and Tim Waggoner, author of Supernatural: Carved in Flesh. The Book Fair runs from 1-4 PM. The library's first floor Flood meeting rooms will house adult authors, while the young adult and children's authors and illustrators will be in the library rotunda. Also on hand will be book appraiser Andrea Klein from Akron's Bookseller Inc., Antiquarian Books & Magazines. Patrons may bring up to three books for her to appraise in the Laurel Lake Room of the library from 1-4 PM. All the events are free and open to the public. For more information, contact the library's Reference Desk or Young Adult room at 330-653-6653. Tim Waggoner's book Dark Faith: Invocations was available from LibraryThing Early Reviewers. Tim Waggoner's book Cross Country was available from LibraryThing Early Reviewers. 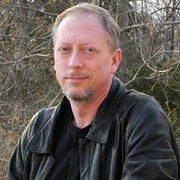 Tim Waggoner is currently considered a "single author." If one or more works are by a distinct, homonymous authors, go ahead and split the author. Tim Waggoner is composed of 1 name.